On Monday the 24th of March, the Coach House Trust are moving in to the docks to clear away the pioneering ecology that has found its home here. This clearance marks the first stage of the site’s regeneration – a project led by the developer and landowner New City Vision who plan to make a high-end housing and commercial complex of this site. The dock’s Green Mantle has become host to a fascinating array of birds, invertebrate and mammals, and has also served as a place of solace and inspiration to many people. On the eve of this clearance, a small lit vessel made of the site’s biomass will be released into the river and carried out to sea by the receding tide. 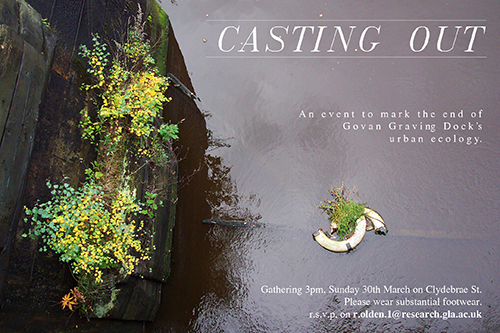 This event has been made possible by the knowledge and skills contributed very kindly by the GalGael.